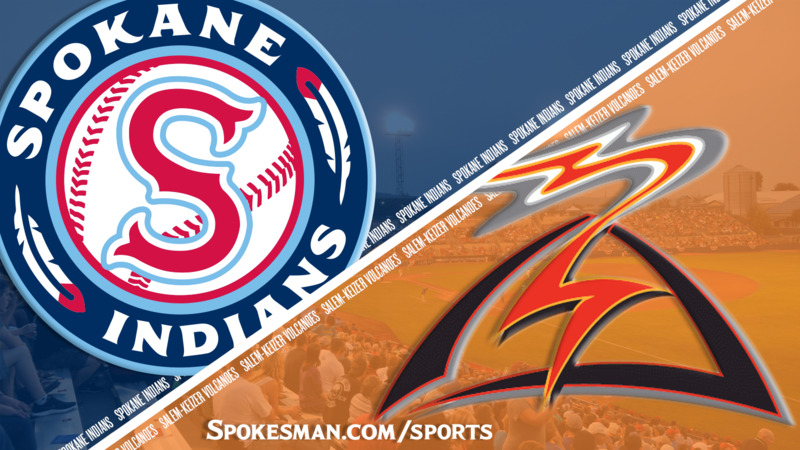 Making his third start with the team, Rodriguez held the league’s best offense in check for six solid innings on Thursday, and the Indians opened a crucial five-game series with an 18-4 blowout win over the Salem-Keizer Volcanoes at Avista Stadium. Of course, it wasn’t all about the Indians’ pitching. Tanner Gardner went 4 for 5 with an eighth-inning grand slam and eight runs batted in, the most by an Indians player this year. Diosbel Arias reached base six times, scored three runs and added 10 points to his league-leading batting average of .365. Those two led an Indians offense that scored more than seven runs for the first time since July 24 and set season highs for runs and hits (20) … all without taking any pregame batting practice. Gardner said that was the case because of the team’s 4 a.m. arrival back from their road trip the night before. The plan seems to have worked. The Indians (15-13 second half) have 10 more games to close the gap in the Northwest League’s North Division, which dropped to one game after Boise’s 3-2 win over Vancouver on Thursday. Seven of those games are at Avista, including a season-ending three-game set against first-place Vancouver. Rodriguez improved his NWL earned-run average to 1.37, and his six strikeouts boosted his total to 20 in 19 2/3 innings with the Indians. In six starts in the Arizona League earlier this summer, he had an ERA of 3.52 with 55 strikeouts in 38 1/3 innings. The Indians’ offense got off to a quick start. After giving up back-to-back singles to right to start the first inning, Volcanoes starter Miguel Figueroa struck out Curtis Terry but otherwise struggled to throw strikes the rest of the inning. He was bailed out of worse trouble by his infielders. With Arias at bat, Hasuan Viera was thrown out at second on a double-steal that scored J.P. Martinez to clear the bases and make it 1-0. But Figueroa walked Arias and the next two batters to get back into trouble. Gardner’s two-run single to right made it 3-0, and Troy Dixon brought in Francisco Ventura to add another run with an infield single. Gardner was thrown out trying to score from second on that hit, ending the rally. The Indians sent eight to the plate – seven of whom reached at least first base – and Rodriguez needed just 10 pitches in a 1-2-3 second inning to bring the Indians back to bat. The Indians got another run in the third when Terry scored on Sherten Apostel’s sacrifice fly to left, and made it 6-0 on Gardner’s single to center that scored Arias. That was the end of the night for Figueroa (0-5, 7.82), who threw more balls than strikes (27-26) and has yet to win a start for the Volcanoes in five tries. The opening frames went quite the opposite for Rodriguez. Of his first 12 outs, four came on strikeouts and five came on the first pitch. Of his first 43 pitches, all but nine were strikes. He got into a bit of trouble in the fifth, when the Volcanoes (13-15) finally got to him. Rodriguez surrendered three hits – including one that slipped past Dixon in left for a run-scoring error – that got Salem-Keizer on the board. But with runners at second and third, he induced a liner to short and struck out Joey Bart, the second overall pick in the 2018 MLB Draft, to end the threat. The Indians added a pair of runs in the sixth and blew open the game with an eight-run eighth, capped by Gardner’s grand slam. Terry’s three RBIs boosted his league-leading total to 51. Left fielder Dixon went 4 for 6, his first four-hit game of the year. Since a July 8 low of .083, he has raised his batting average to .205. … Crouse, the Texas Rangers’ No. 5 prospect, has made two starts for the Single-A Hickory Crawdads since his Aug. 11 promotion. He is 1-0 with a 2.08 ERA. Published: Aug. 23, 2018, 10:19 p.m. Updated: Aug. 23, 2018, 10:37 p.m.